1234 | What Does 1234 Mean? 1234 means "1 Thing 2 Say 3 Words 4 You (I Love You)". 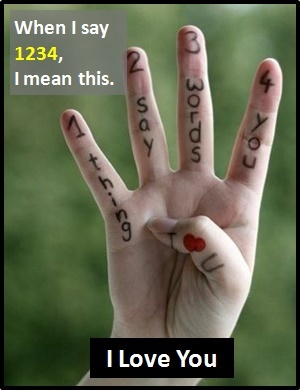 1234 is a form of shorthand used in texts or instant messaging with the meaning "I Love You". 1234 is typically used when the sender wishes to add emphasis to their declaration of love, often when responding to a similar expression of love or an act of kindness. 1234 Is typically used by truly besotted people to mean I Love You. Person A: Thank you for last night. It was the best night of my life. I can't wait to see you again. 1234. Singer: Err, thanks. Glad you enjoyed the show. Vlad: I fixed it for you. You can't lose. Don: Thanks. 1234. You're the greatest and most beautiful friend a guy could have. 1234 is classified as a cyber term as opposed to an�initialism abbreviation�or an acronym. Initially, cyber terms were introduced for brevity, but, particularly with the advent of predictive texting and on-screen keyboards, they are now mostly employed for fun. Cyber terms differ from icons because they are not pictorial representations. Before the digital era, we would have just said something like "I Love You" instead of using 1234. Our Slide Show "Text Speak Based on Numbers"
Read more about text speak based on numbers.